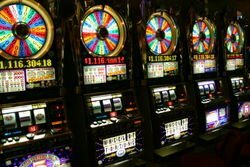 Here's an answer to the critics who doubted that legalized slots in Pennsylvania would boost the economy and create new jobs. Backers of the Isle of Capri slots parlor in Pittsburgh apparently paid residents of that city's Hill District $15a head to attend a rally in support of the proposed slotino. The Morning Call has the story. Meanwhile, Bill Toland of the Pittsburgh Post-Gazette looks into the, um, checkered pasts of some of the applicants looking to build and open casinos in the state. The brain trust in Harrisburg has wasted enough time and resources on the legalization of gambling in Pennsylvania, and this is what we get--a half-baked effort that really only puts money in the pockets of the legislators themselves and anyone close to them! There are so many more productive ways in which to rebuild the economy of the state as a whole by focusing and utilizing the resources that we have here, natural and otherwise, and this is what we get. The country is so reliant on foreign oil, and this is what keeps us hostage to the whims of terrorists, and yet, Pennsylvania sits on vast quantities of coal and the state government could foster means to develop clean-burning coal methods, and we get idiotic, half-baked, warmed-over ideas for casino gambling, done badly. In its present form, it will hurt Philadelphia tourism rather than help. And the racetracks that these bills were initially designed to help will die a financial death anyway! Repeal now, or figure out a better way to do things by studying Nevada and New Jersey laws for starters! Despite what you may believe, the slots legislation did not require ALL the Governor's time during his first term, and he created and implemented a very comprehensive energy plan, one that uses clean-burning coal. hosptalitygirl ... You answered your own question. Bringing gambling to PA wasn't about the economy or jobs or even education. This was always (and only) about tapping the vast $$$$ resources of the gaming industry for the politicians coffers. It was only tied to school funding (just like South Carolina just did for its first lottery) because opponents can be easily painted as anti-education if you protest. As for looking to Nev or NJ for a model ... drive a few blocks off the strip in Las Vegas, or a few blocks off the Boardwalk and you'll get some idea of just how much gambling has helped those communities.